Traveling is one of my passions; the feeling of landing in a new city, trying the local food, having crazy adventures. It’s one of the main reasons my new job was so appealing to me. But kind of travel I do is usually pretty hectic, and now it is going to be much more frequent with work travel thrown in he mix. Between long flights, lugging around heavy luggage and lots of walking around exploring the area and culture, my body can take a beating. Yoga is a great way to take care of yourself while your travel. But classes are not always accessible and yoga mats may not fit in your luggage, especially if you’re packing light. So what’s a yogi to do? Fortunately, there are a few fantastic options that allow you to take your yoga with you, no matter what. There are travel mats that are super thin and able to fold up like a towel, making them extremely suitcase-friendly. Manduka has a fantastic mat (I got mine as a gift from my sister last year and I love it!). It is a thin, no-slip rubbery material that I can take anywhere. 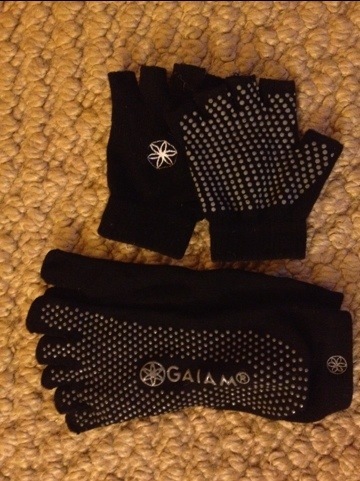 If you want to go even lighter, Gaiam sells gloves and socks with rubber on the palms and soles so you can literally do yoga anywhere. These are also great to use with a mat if your hands tend to get sweaty and prevent you from getting a good grip. Finally, if you don’t feel comfortable making up your own practice, there are several free podcasts that you an download from iTunes. Yoga Download and Yoga Journal are great. If you’ll have your laptop with you, websites like Yoga Today and Yoga Glo offer full-length classes. Yoga Today has one free class each week, but is only $10 per month for unlimited access to all of their classes. Hopefully these tools will help you maintain your yoga practice on your travels so you can keep up your energy for your adventures and still feel rested when you get home. Bon Voyage!